Pioneers in the industry, we offer carpet cleaner from India. Puzzi 10/1 with floor nozzle/upholstery nozzle for cleaning carpets and upholstery using spray extraction. Ideal for smaller areas. With integrated cable hook and holder for handle with trigger/suction pipe. Puzzi 10/1 with upholstery nozzle and floor nozzle is particularly suited to hygienic and effective cleaning of small to medium surfaces. With 1 bar spray pressure, the spray extraction machine ensures gentle, deep cleaning of textiled surfaces and delivers impressive results, especially when cleaning carpets and upholstery. Thanks to the narrow floor nozzle, the machine is optimally suited for use in confined spaces. 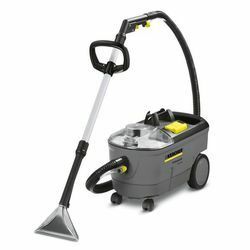 The flexible suction lips allow cluttered areas to be cleaned easily. The spray extraction machine is fitted with an integrated cable hook and a holder for a handle with trigger and suction pipe. Perfectly suitable for everyday use :Adjustment of the handle without any tools; accessory/cord fixings; quick change from floor to upholstery nozzle. Storage compartment for cleaning agent tablets :With practical on-board storage compartment for tabs. For need-based dosing. Versatile : A range of accessories for versatile applications (e.g. crevice nozzle for cleaning car seats and upholstery).